Mark your calendars for October 17 to witness a painting that is as gruesome as it is great. 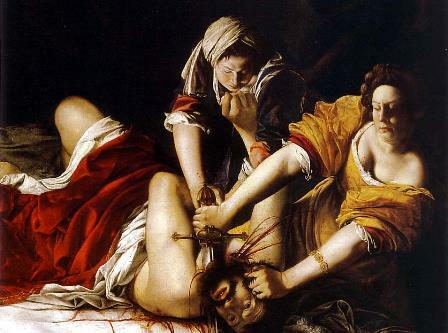 "Judith Slaying Holofernes" was painted in Florence nearly 400 years ago by a woman named Artemisia Gentileschi. In an era dominated by male painters, Artemisia was a standout artist. Jealous men claimed she had help from her father – a follower of Caravaggio – but she developed a sensational style all her own that featured dramatic lighting, bold composition and a penchant for strong female figures. The reason for her emotionally charged works may reside in Artemisia's own story. When she was 18 years old, Artemisia was raped by a family friend. Her father pressed charges and during the 7-month trial his daughter was tortured with thumbscrews to "verify" her testimony. The man was convicted but never jailed. Some scholars have viewed Artemisia's nearly life-sized canvas as a kind of revenge fantasy for the violence committed on her. The painting depicts a key moment from the Book of Judith, a book that exists in some versions of the Old Testament. With her country under siege, Judith and her maid slipped into enemy headquarters, gained the trust of the General Holofernes and got him drunk. Then they beheaded him, causing his army to disperse and saving their countrymen from the invaders. Whether the story is true or a parable, Artemisia's painting cuts as deeply as Judith’s sword. This exceptional work will be on loan from the Uffizi Gallery in Florence with assistance from the Foundation for Italian Art and Culture. The Art Institute will add context to Artemisia's painting with other artwork of the Baroque era. "Judith Slaying Holofernes" will be on view only from October 17 to January 9. Then, she ends her first trip to Chicago and returns to Italy.